Orange Tree Samples Slide Acoustic Guitar - библиотека сэмплов акустической слайд-гитары. 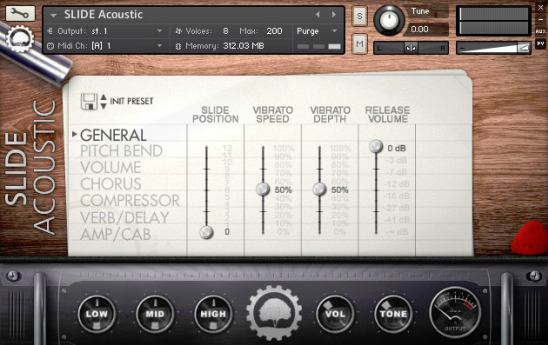 Orange Tree Slide Acoustic Guitar - sample library for Native Instruments KONTAKT acoustic slide guitar is mainly designed for blues, country, folk. Rather than including pre-recorded slide articulations, which would limit the intervals and speeds of sliding, we've developed an ultra-realistic slide engine that models all the nuances related to slide articulations. Orange Tree Slide Acoustic Guitar also includes a slew of effects, including tremolo, chorus, reverb, delay, amp modeling, and much more. That way you have complete slide guitar tones readily available right out of the box. There is a preset system that lets you load factory presets as well as your own external preset files quickly and easily.